Dwight Bolinger was born in Topeka, Kansas on August 18, 1907. 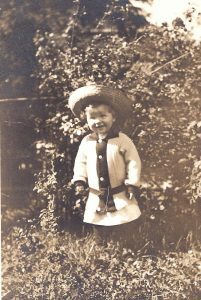 His parents were Arthur Joel Bolinger, known as “AJ,” and Nellie Gertrude Ott, known by her middle name of Gertrude. (See the above photo of Dwight, Gertrude, and AJ.) AJ’s father, William Bolinger, owned a store specializing in sewing machines and musical instruments, and belonged to the Modoc Club, a famous singing group from Topeka. AJ’s mother was Ada Adelia Hostetter. 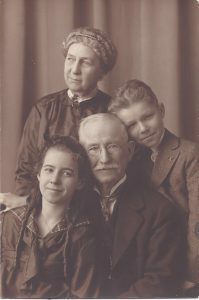 Gertrude’s parents were Hamilton Ott, pastor of Topeka’s First Lutheran Church, and Lydia Augusta Rowe. Ott’s involvement in the church led him to write A History of the Evangelical Lutheran Synod of Kansas, published by the Synod in 1907. An undated photo of Gertrude appears below. 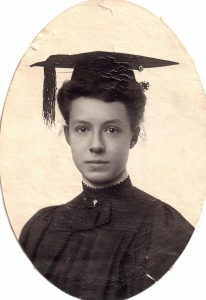 Gertrude is shown below in her college graduation photo. AJ and Gertrude met at Washburn College, as it was known then. Following graduation, they married on June 9, 1906, with the Reverend Ott officiating. 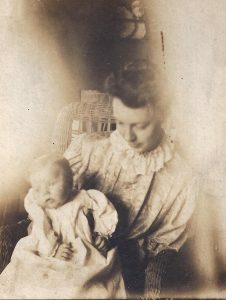 (For more on AJ, Gertrude, and their respective families, see the separate website on the Bolinger family history.) 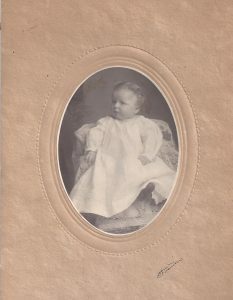 Two photos of the infant Dwight, with Gertrude holding him at left, appear below. Two more views of young Dwight appear below. During this period AJ worked for several law firms in Topeka and was Assistant County Attorney (1909-1910). Dwight below enjoys his two friends. The above photos suggest a happy childhood. Gertrude was an accomplished pianist and organist, playing the organ at the Christian Science Church in Topeka and probably also in her father’s Lutheran Church. Dwight could remember, at ages three, four, or five, while perched in his high chair, listening to her play piano exercises. He attributed his fascination with music, and his desire to become a composer, to that period. Without a doubt the biggest formative event in his life was the death of his mother on Nov. 1, 1915 when he was eight years old. A review of his elementary school report cards shows the turmoil he must have been going through. In first grade (1913-14), he received one failing grade but seven excellent and the rest good. 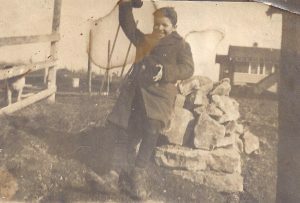 But in the second grade (1914-15), when he was seven years old and when Gertrude was in failing health, he had eleven failing grades, the rest excellent or good. 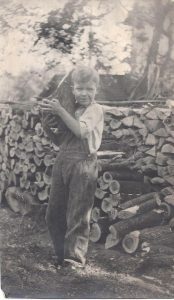 In third grade (1915-16), when he was eight, there were eight failing grades. This was the school year when she died. His father remarried the following year to Ella Harrison who was not equipped to be a mother to an eight-year-old. Her poor health, then having to bear three children, and the economic hardships that were to come made things worse. So not only was there the pain of the loss of his mother, but also the absence of any affection from his stepmother. The only happiness he had from adults in his family were from his two sets of grandparents, who were very good to him. During his religious training in that period Dwight was taught that it was sinful to think bad thoughts about someone and that he should confess his sins. So he confessed that he did not like his stepmother and was promptly punished for having those thoughts! In 1916 AJ moved his family to Kansas City, joining a law firm that specialized in cases involving disputes between railroads and farmers over the rates charged by the former. But on December 26, 1917 President Wilson nationalized the railroads, leaving the firm with no clients, so AJ decided to go into farming, selecting a farm near Stover, Missouri in the Ozarks in central Missouri. 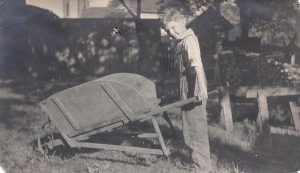 So probably by 1918, AJ was having to support his family by farming. Once again, his timing was poor; the farm depression hit in the 1920s and there were times when the family did not have enough to eat. AJ’s granddaughter, Mary Margaret McKinley recalls being told that their farming was strictly subsistence farming. They had chickens and goats and may have had a cow, but they didn’t sell any crops. Making things worse, the soil where the farm was located was rocky Ozark soil and, unless a person owned some creek “bottom land,” it was not fertile. The birth of Dwight’s half-siblings added to the family’s stresses. Dwight’s sister Ruth was born on the farm prematurely. AJ and Ella’s father took a dresser drawer and devised a way to keep it warm, creating a homemade incubator. Ruth’s grandfather Harrison stayed by her side 24 hours a day. Years later, she would say that she owed her life to him. During the period the family was living on the farm, school became a substitute for his unhappy home life. While enrolled in the Carlisle School near Stover, he told his 7th grade teacher that he preferred being in school rather than at home, something that the teacher passed on to his grandparents in Topeka. At the end of the day when all the other school children raced off, happy to be finished for the day, Dwight did not want to leave. Dwight’s school years played a part in his interest in education. During a visit to the Stover area in 1990, Dwight looked up an old friend from his Carlisle School days, Glen Franklin, shown below. 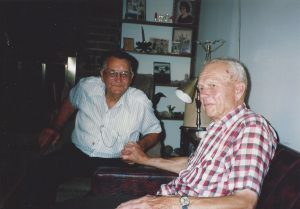 Dwight and Glen Franklin, former classmate of Dwight’s at Carlisle School, were reunited in 1990 at the Franklin home on Little Buffalo Creek, south of Stover. Dwight and Glen were classmates in the 7th and 8th grades at Carlisle, which was about a mile from the Franklin home. 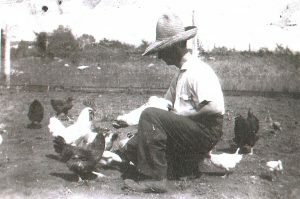 A rare photo of Dwight on the farm near Stover, Missouri. Grandpa Harrison, Dwight, and AJ Bolinger. Photo courtesy of William Bolinge. of Leawood, Kansas. AJ feeding the chickens at the farm near Stover, MO. Photo courtesy of William Bolinger of Leawood, Kansas. 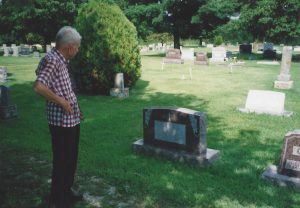 Dwight’s fondest recollections were of his teacher, Bessie Esther Gehrs (see cemetery marker below), whom he liked very much. 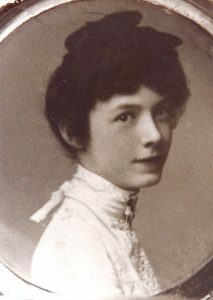 Bessie Esther Gehrs was 19 when Dwight began at Carlisle School and 22 when he moved to Versailles. Her young age–Dwight would have been 11 when he enrolled at the Carlisle School and 14 when the family moved to Versailles–probably made it easier for Dwight to enjoy her as a teacher. 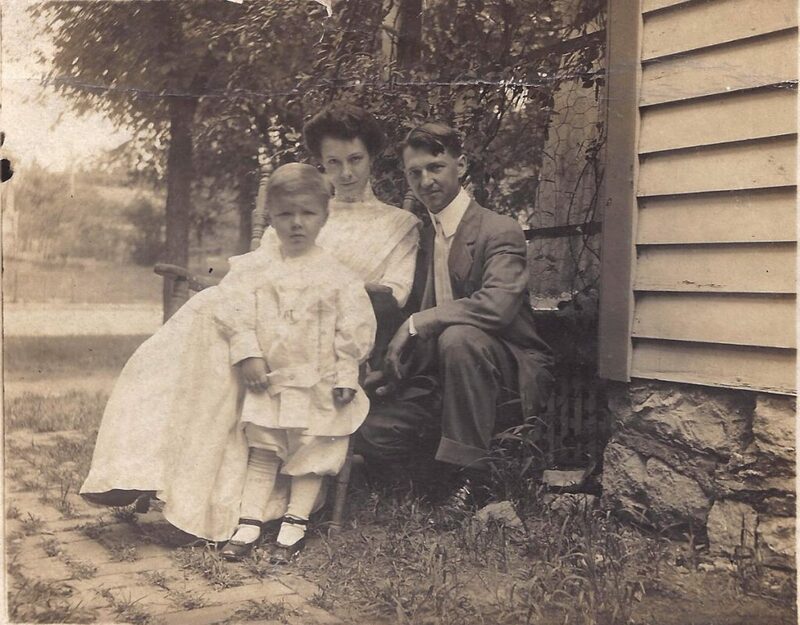 Bessie’s father, George, had been born in Missouri of German parents and her mother, Fredericka, was from Germany. The 1920 Census lists Bessie as a public school teacher but by 1930 it appear she was no longer teaching. 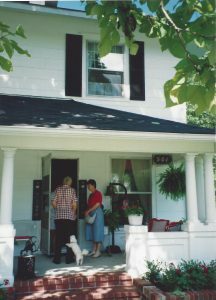 The census records of 1920, 1930, and 1940 list her as single and living at the family home, a farm, in Haw Creek, Morgan County. By the 1930 census her sister, Anna, and brother, Homer, are no longer listed as living at home. By 1940 the census shows she was 42 and it appears she may never have married. With her father and mother by then ages 76 and 66, respectively, she may have been caring for them. Grave site of Dwight’s favorite teacher, Bessie Esther Gehrs, 1897-1986, at the Stover Cemetery. Dwight had never been to the cemetery before and had no information as to the grave’s location, and yet he went straight to it. Photo circa 1990. It was during this period that his sister Ruth was born. Dwight could remember holding her in his arms. “She was my little baby,” he said. 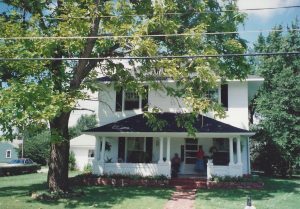 Perhaps because of the farm depression, in 1921, AJ moved his family to Versailles, the county seat of Morgan County, Missouri to resume his practice of law. There Dwight’s brother Bill and sister Mary were born. Versailles is a small town and even as recently as 2010 it had only 2,482 people. A Wikipedia article on Versailles lists five notable people from Versailles: Dwight Bolinger, linguist; Bud Walton, co-founder of Walmart; Bill Laurie, former owner of the St. Louis Blues ice hockey team; John Franklin Rutherford, founder of the Jehovah’s Witnesses; and William E. Morris, founder of the Libertarian Party of Delaware. The following three photos of Dwight performing chores may have been taken in Versailles. The first photo has what appears to be a neighborhood in the background, rather than a farm setting. 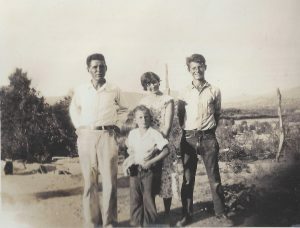 Dwight and his cousin Mildred, a year and a half older than Dwight, appear below with their grandparents, William Bolinger and Ada Adelia Hostetter. As someone said, they are the type of grandparents everyone wished they had. Unhappy at home because he did not get along with his stepmother, Dwight was particularly close to his grandparents. In 1921, Dwight was faced with a conflict. He had gone back to Topeka for junior high school but AJ wanted him to attend high school in Versailles. Dwight did not think the school system there would prepare him for Washburn College, where he planned to study. He had always assumed he would have a college education. Besides, both sets of grandparents wanted him to go to high school in Topeka. The only solution was to run away from home. Planning ahead, one of his grandmothers sewed $5 in Dwight’s underwear for expenses. One night in September, after everyone else in the house in Versailles was asleep, Dwight slipped out the window of his second floor room onto the porch roof, made his way across it, and slid down the pillar to the ground. A photo of the house below, taken over a half century later, shows little has changed. Only the brickwork is new. 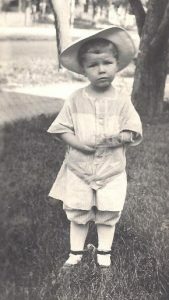 Dwight’s half-sister, Ruth, would have been about eight months old when Dwight ran away from home and his stepmother would have been expecting Dwight’s half-brother, William, who was born in December of 1921. Dwight’s home in 1921, 501 N. Monroe, Versailles. Photo circa 1990. Dwight and his niece, Mary Margaret McKinley Concannon, are invited in. 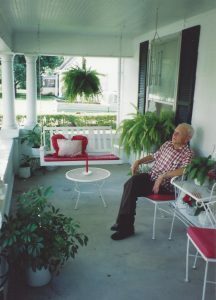 A chance to relax on the front porch. Dwight had to get away from Versailles as quickly as possible. Once AJ realized Dwight was gone, he would come looking for him. The only way realistic way to get to Topeka was by train. AJ would expect to find him at the Versailles train station, so Dwight took off for the train station in the tiny town of Cole Camp, 21 miles west of Versailles. Walking all night, Dwight hid in the weeds by the side of the road whenever he saw headlights of an oncoming car. By contrast to his school performance in 1914-16, mentioned above, by the time he was back in Topeka, away from Versailles, and living with his grandparents, school records for his ninth grade (1921-1922), show that his grades were 27 Excellent, 3 Very Good+, 4 Very Good, 3 Good+, and 25 Good. There were no Fails. He was in the right environment. 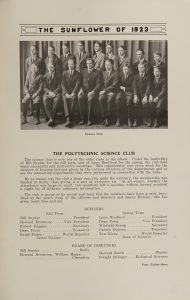 One of the few records from Dwight’s time at Topeka High School is a 1923 yearbook record of his membership in the Polytechnic Science Club. In the photo below, he is at the far right, back row. Note that he is on the club’s board of directors representing the biological sciences. While attending Topeka H.S., Dwight lived with his grandparents, Hamilton and Lydia Ott. 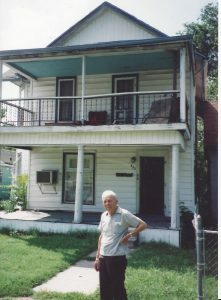 Dwight is shown in front of the home in a photo taken about 1990. After the death of Hamilton Ott, on March 28, 1923, his widow, Lydia, decided to move to Springfield, Ohio and Dwight went with her. 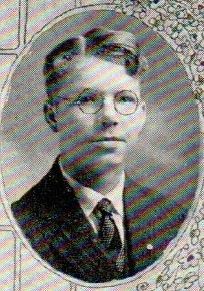 As a consequence he transferred from Topeka High School to Springfield High School in early 1923, graduating in 1925. 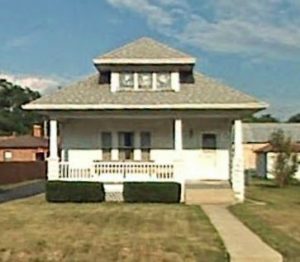 Dwight and Lydia’s address in Springfield was 322 S. Clairmont. A Google view of it in 2017 appears below. Even if it has been remodeled since 1925, the photo shows a modest home, as might be expected for a clergyman’s widow. Springfield High School records listed Lydia as Dwight’s guardian. While in Springfield Dwight worked for a collection agency, trying to collect money from people who owed for groceries. He got “punched around” by some debtors. Then he tried creating his own collection agency, even having rubber stamps made for his paperwork. Memories he had of Springfield H.S. included the echoes of a Grieg concerto in the corridors and a portrait of his great grandmother, Lydia Augusta Greene, wife of the Rev. John Rowe, that he passed every day between classes. The portrait below is very possibly the one at the high school. 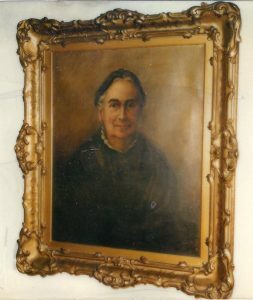 Portrait of “Grandmother Greene” from R.W. Wescott of Madison, N.J.
and copies of pages from the 1924 and 1925 Yearbooks. It appears that Dwight’s only extracurricular activity, other than working for a collection agency, was his membership in the newly formed Star and Atom Society, the high school’s honorary science club, which makes sense in light of his membership in the Polytechnic Science Club at Topeka H.S. Described as the most flourishing club on campus, the Star and Atom Society hosted discussions on such topics as Biological Evolution, Vaccination, the Moon, Relativity, November Constellations, the Eclipse of the Sun, and Is Mars Inhabited? A student would make a presentation on the topic followed by a discussion by another student, then general discussion. Very possibly, Dwight was one of the presenters or discussers. Dwight’s grades at Springfield H.S. were almost uniformly excellent. The only time semester grades were less than 90 in any subject were in Latin I and Latin II when he received 80s. But his performance improved dramatically by Latin IV when he received a 95 and 96. In English, his first semester grades were 90, but by his last semester he finished with a 97. Algebra went from 90 to 95. His strongest performance in any subject was in the first semester of Physics IV when he received a 98. That subject made such an impression on him that even decades later he could still quote passages from the physics text verbatim! In the group photo in the 1924 Yearbook, Dwight may be in the back row, far right, wearing glasses. 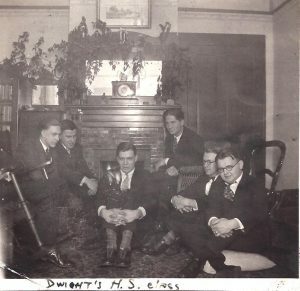 In the first of the two photos in the 1925 Yearbook, Dwight appears to be in the back row, third from left, wearing glasses. Two photos survive of members of Dwight’s high school classmates. 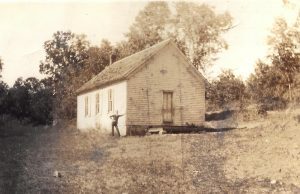 The year of 1925-26, while living at the nearby Mason farm, he spent teaching at the Lindloff School, a one-room rural school near Stover, Missouri. Located on Little Buffalo Creek, it was three miles north of Carlisle, where Dwight himself had gone to school. 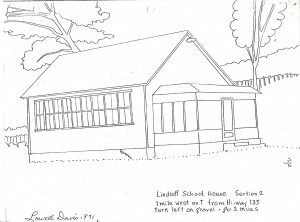 Lindloff School, 1925. It is probably Dwight who is leaning against it. The sketch of the school below, done in 1971, gives some idea of its subsequent changes. Sketch courtesy of the Morgan County Historical Society. 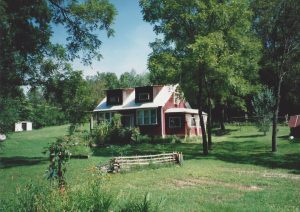 The school, in a 1990 photo shown below, is now a private residence. After a year of teaching, Dwight wanted to be outdoors. 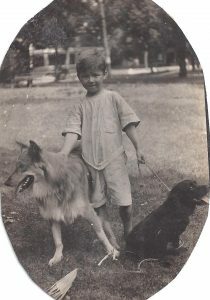 His mother’s sister, Grace Ott Abins, with whom he was very close, was living in Colorado where she was breeding collies. Her husband, John, was trying to homestead land at Alamo near Ludlow. They had three sons, David, Feodor, and Philip. 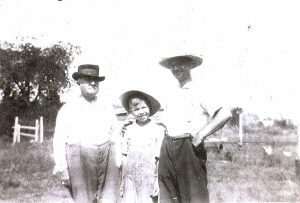 John Albins left, Grace Ott Albins center, and sons Feodor and Vladimir. That summer of 1926, before beginning his first year at Washburn, was memorable, but not in the way one would hope. Dwight and his uncle John set out to earn some money selling suits in the oil fields of the Texas Panhandle at the time of the oil boom. An argument between the two led to John driving off, abandoning Dwight, leaving him on foot with no money, no food, no friends, and no place to stay. Dwight’s story, “Three Days as a Vagrant in the Panhandle,” appears elsewhere in this website. 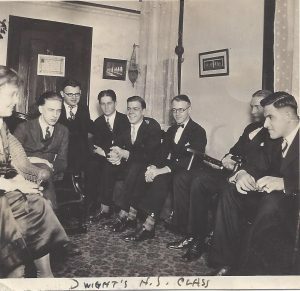 Dwight remained with the Albins family until late August when he returned to Topeka to begin at Washburn College. 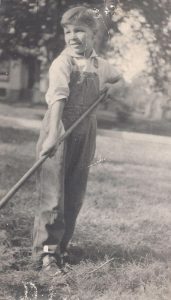 His grandmother, Lydia Ott, with whom Dwight stayed while enrolled at Springfield High School, died in 1928, only two years after Dwight went on to Washburn. To proceed to Dwight’s college years, click here.